Eggplant. You either love it or hate it. I happen to love it and plant it in the garden every year. This year we planted two kinds – Little Finger and these pretty striped ones. This variety, and I can’t remember which it is, produced a really nice eggplant – no bitterness at all and nice and meaty. Last night Mark said he wanted eggplant parm for dinner. I just didn’t feel like going through my typical process – peel, slice into rounds, dredge in salt and pepper-seasoned flour, dip in egg, then breadcrumbs and fry carefully in olive oil. I like eggplant. I wanted my eggplant parm to be all about the eggplant and not so much about the breading. Then it occurred to me. I really love fried green tomatoes and the secret to a crunchy flavorful fried green tomato is buttermilk. So I thought, what would happen if I peeled the eggplant a little thicker, lengthwise then dipped it in buttermilk then flour and fried it up. And what would happen if I changed up the oil? 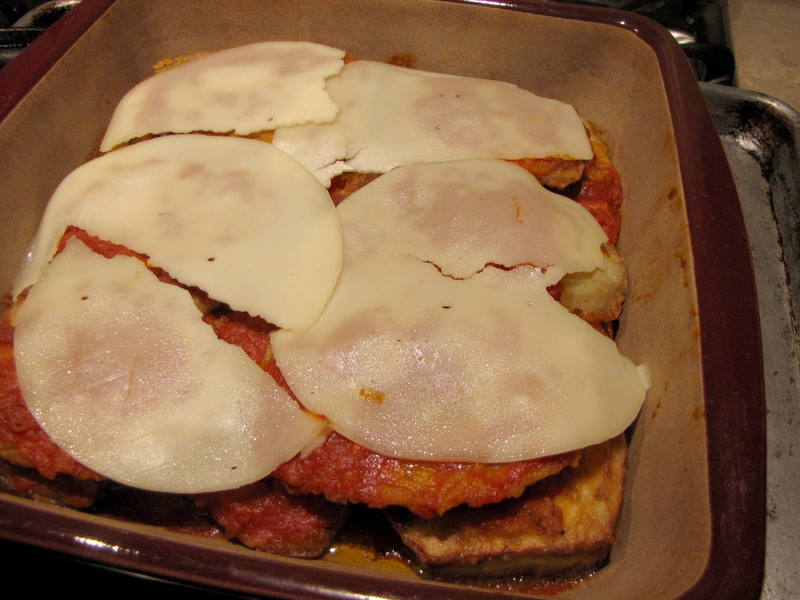 And the cheese too (because I forgot we used up all the mozzarella and I didn’t feel like going to the store)?!? Guess what? It turned out great. Preheat oven to 350F. Peel eggplant, slice lengthwise 3/8″ thick. Dip in buttermilk then dredge in seasoned flour. Heat oil over medium, high heat. Fry eggplant till golden and crispy, in batches. 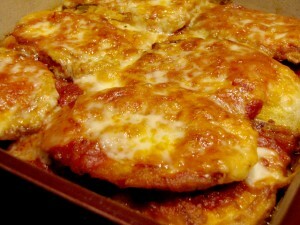 In a 9×9 pan, put a little sauce in the bottom, then put a layer of eggplant on top, more sauce, then eggplant. Top with sauce, cover with foil and bake for 25 minutes. 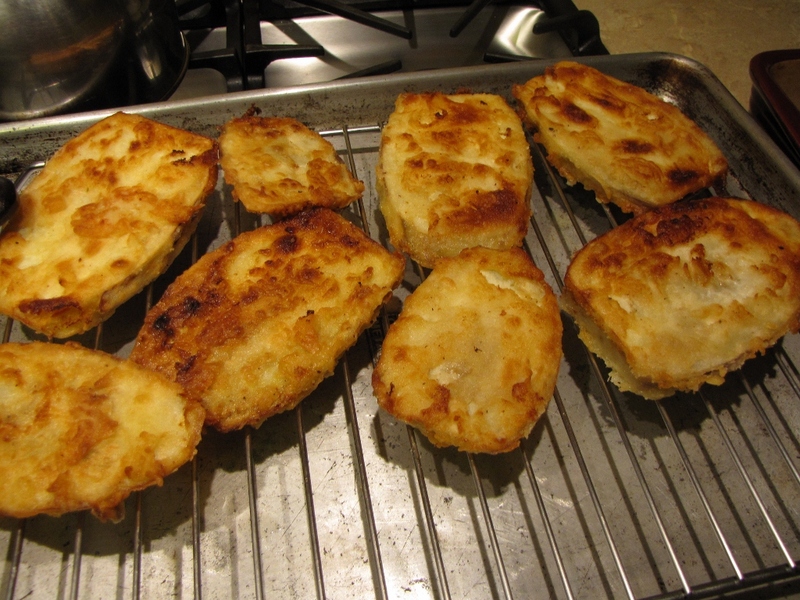 Remove foil, top with cheese and bake for another 15-20 minutes. 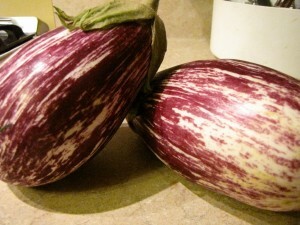 By using a 2/3 to 1/3 olive oil to vegetable (canola) oil mix, you can fry the eggplant at a higher temperature. The buttermilk really coats the eggplant and doesn’t affect the overall flavor of the dish. 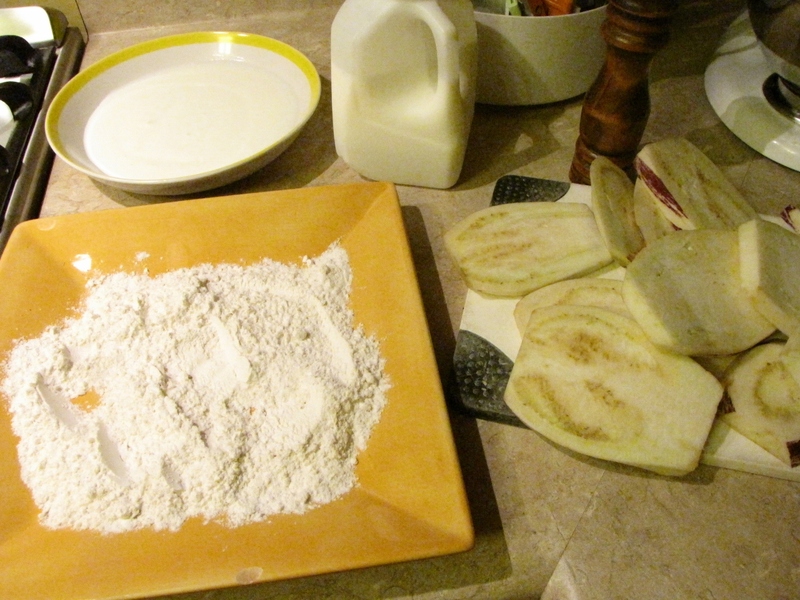 The flour fries up nice and light and still lets the eggplant shine. Most recipes call for parmiggiano reggiano and/or mozzarella cheese. Provolone (especially sharp provolone) works because it has the melty quality you’re looking for in mozzarella and the sharpness of parm. Hot, bubbly – ready to dish up and eat! I guess the moral of the story is: use what you have. Experiment in the kitchen. You never know, you may end up with something even better than originally intended. Have fun in the kitchen! This looks delicious. I’m not a real eggplant fan, but I think I may try this.